I have come across some salary statistics of Russian software developers at the job portal Superjob.ru. The portal has over 40,000 job postings per day, so I thought it may have reliable numbers when it comes to the salary figures. First of all in Russia, in 2012 salaries in IT space have increased by around 8 percent for the past year, compared to April 2011. 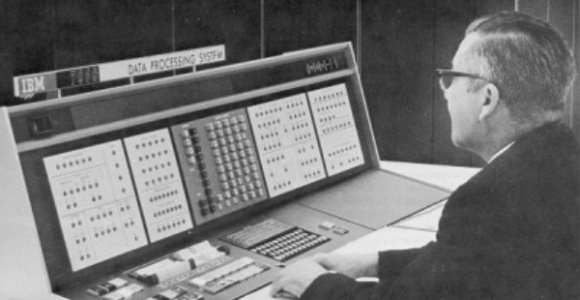 The most recent analysis has been published for July 2011, when the IT salaries on average were 7.5 percent lower than today. So here are the salaries of Java developers broken down by city and by the level of experience, as reported by Superjob.ru and increased by 7.5 percent to arrive to the current figures. 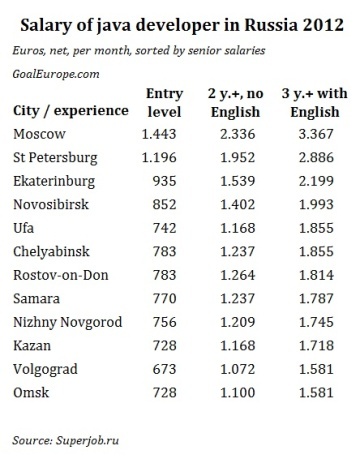 The most expensive cities in Russia to hire a java developer is Moscow, Saint Petersburg and Ekaterinburg. The numbers probably hold true for any other software development jobs in Russia. Novosibirsk is fourth on the list. For an offshore outsourcing, salaries of Java developers with three or more years of work experience with English are most relevant. These range from Euro 1600 (US $2100) net per month in Omsk to Euro 3400 (US $4500) in Moscow. See the tables for further information (for our American readers we also prepared figures in dollars, that follow the Euro table). Contact us for advice on outsourcing or selecting a partner to open a development center in Russia or elsewhere in CEE.